This group will provide you with the opportunity to own and tell your story, while being seen and loved through the process. Come ... be your bravest self and connect with other like-minded, open women. Talk about shame and shame triggers. Practice empathy and self-compassion. Challenge the myths about vulnerability. Understand how your values can light your way. Become more resilient. Let go of perfectionism and your fears about what others think. Cultivate the belief that you are enough. The Daring Way and Rising Strong are based on the research of Dr. Brené Brown, the #1 New York Times bestselling author, featured on Oprah’s Super Soul Sunday. Dr. Brown’s books include: The Gifts of Imperfection, Daring Greatly, and Rising Strong. To learn more, watch Brené’s talks: The Power of Vulnerability and Listening to Shame. After going though the eight weeks, I find I am experiencing much less self-loathing, more acceptance, and a greater willingness to identify my own truth and act on it. The group facilitator was superb—open, accepting, affirming, never shaming. I find that both during and since this group, I have experienced huge growth in my ability to self-reflect, acceptance and comfort with “the process” of becoming. Thank you for providing a safe, warm place to do the hard “heart” work of this process! Working with the empathy and self-compassion pieces of this program were so very important for me because I had so little for myself. I learned it is necessary to to give these to myself in order to experience a life worth living. This group is about The Reckoning. The Rumble. The Revolution. 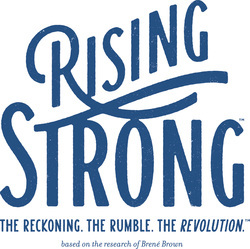 Rising Strong™ is about what it takes to get back up and try again after we fall – “The physics of vulnerability is simple: If we are brave enough often enough, we will fall.” It’s about owning our stories of struggle and empowering ourselves to write new endings to those stories. An 8-week course to learn tools for self-care, optimal health, healing and transformation. A loved one dies. We grieve. Grief is the normal and natural response to a loss. And death, loss and grief are stressful. The emotional roller coaster (and marathon) of grieving is very often physically and emotionally exhausting. We are heartsick, sick with grief, heartbroken. Research has found that although a normal and natural process, the prolonged emotional response to the death of a loved one can leave us prone to infection and disease. Grieving can take an immense toll on the human body. This 8-session group will offer participants a safe place to explore a variety of different methods to nourish and replenish their depleted reserves and help them to deal with life change, stress, illness and grief. Self-care, self-awareness and health promotion are at the core of a Mind-Body Medicine Skills Group. Healing techniques may include: Breathing, Guided Imagery, Expressive Movement and Movement Meditation, and others. No previous experience, skill or talent is needed. Are you interested in being notified of my upcoming groups and events? Contact Carol to be added to my ongoing group notification list.